This week’s a bit of a review-catch up! I haven’t written many reviews this month, and I need to get some published, in time for my Steampunk event on the 1st! By Lauren Kate, published by Random House. And then Eureka uncovers an ancient tale of romance and heartbreak, about a girl who cried an entire continent into the sea. Suddenly her mother’s death and Ander’s appearance seem connected, and her life takes on dark undercurrents that don’t make sense. My Review: Ah! So many mixed feelings about this… I’m not entirely sure how to review it! Teardrop was a great book… But there were points when I was just really unsure of what to make of everything. I’ll talk about the characters first! Eureka sounded really unique. And she most definitely was. She’s a very conflicted teenager, who recently attempted to kill herself, because of all of the trauma she had gone through with her mother’s death. Right from the beginning, where she’s stuck in another psychiatrist’s office, I could sympathise with her. She was a really realistic character, for the most of the book. At a couple of points, I found it a little hard to love her. But mostly, she was a great character. Ander and Brooks are the love interests. I got so annoyed… Yet another love triangle, with one mysterious, stranger boy, one male best friend…. Cliched. I’ve read too many books like hat, so this really made me want to give up. Though, I did persevere, because of the book’ school concept! Ander is a character you can grow to like, but I didn’t particularly. He just seemed so… Stereotypical! Brooks, the best friend, I liked much more than him; though, of course, he was a very stereotypical character too. Onto the plot. The plot was unpredictable, definitely. I had no idea where the story would go, mostly! There were some really cool inspirations behind the story- the mythological aspects. That was the reason that I requested this! It took a while for the whole mythology and mystery behind the objects Eureka inherited to be explained. But I think it was all really clever. There’s a story behind it, based around Atlantis. I’m really interested in that mystery, so obviously I became very interested in this story. I was very worried about all of the revealing: it was, if I remember right, less than a hundred pages until the end before we even got to know a big chunk of everything. I discovered there’d be a sequel (how did I not know this before?!) just before I’d finished. Even though I’m not very keen on a few parts of this book, I probably will rush to the stores as soon as the sequel’s out- as I need to know the rest of the story, and I want the mythology detailed on some more! The writing was good. I’m not entirely sure how to talk about it… The descriptions, especially of one particularly gruesome scene (which. Was. Awesome.) were really vivid and realistic. Lauren Kate has a really great writing talent. Though, I don’t think it was the best. I wasn’t particularly gripped, as such, but I definitely did want to keep reading! 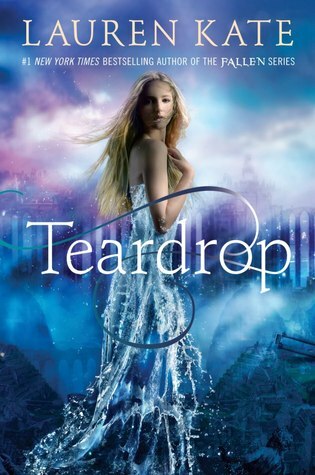 Overall, I’m really not sure of my overall opinion on Teardrop! The ideas behind it were great, and Lauren Kate has created a book that really details, in a fascinating way, on the myth subject, but just not enough, so everyone who reads it (including me!) will be itching for the sequel. The plot was great, and the events were pretty much unpredictable. I wasn’t the biggest fan of the ending, because while it was very dramatic and shocking, I didn’t feel like I was pulled into the story enough to enjoy it as much as I would have hoped. Eureka was a great main character, who had an interesting and sad past. I liked her as a character, but really couldn’t get on with the love triangle and the two male love interests who have been used in so many YA paranormal romances before. This book will appeal to lots of people. I’m sure it will do brilliantly. However, I just couldn’t get on with parts. Recommended if you’re a fan of the genre, though! This is a good book, but there were just too many points that have been done before- so that made the rate drop from my original idea of a four! I received a copy of Teardrop from the publisher, in exchange for a review. In no way at all did this affect my thoughts. This entry was posted in Uncategorized and tagged mythology, paranormal, romance on November 25, 2013 by keithbwalters. AAAAAhhhh… I haven’t commented on your blog for ages! So I promise I will try to comment on ever single post you publish! LOL 😀 Anyway, I love this cover and it looks very good. Although 3 stars isn’t bad, it could have been better. I’m glad you ‘kind of’ enjoyed it! I feel you so much here. I just. . .did not get Ander. The book wasn’t the best I’ve read, but I think I’ll try the second. Yes, me too! Ander’s just a character I’ve seen repeated over and over in YA romance. I hope you enjoy the sequel more! I hope I enjoy it more too, haha 🙂 Thank you for the blog follow, by the way!